03 October 2018: NIACL Department is going to conduct Mains examination for Assistant (Class III) Posts. Candidates who qualify preliminary examination may download NIACL Admit Card 2018 for Mains Exam. The Department will conduct Mains Examination on 06.10.2018. Mode of Examination: Offline Written Examination. 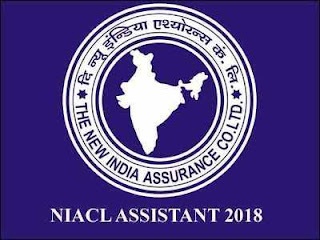 The New India Assurance Company Limited (NIACL) has recently released a recruitment notification to fill the various posts of Assistant. The applications were invited for the total 685 posts. The application process was Online. All the Candidates successfully filled there application form and now when they submitted there form, they start preparing for the exam. The Exam Will be Conducted in Two Phase i.e. Tier I – Pre Exam & Tier II – Main Exam. Tier I – Pre Exam Will be Conducted on the Date 08th and/ or 09th September 2018 (Tentative) & Tier II – Main Exam will be Conducted on the Date 06th October 2018 (Tentative). More Details About the Exam is Provided Below. Many candidates have applied for the given posts as the NIACL is India’s Premier General Insurance Company, owned by Government of India. Candidates submitted there application form from the Date 16 July, 2018 till the date 31 July, 2018. It was the golden chance for those who wanted to make their career in Government Insurance Company. Now those candidates who have applied for the NIACL Assistant, are curiously waiting for the Admit Card of the Regional Language Test. The students who have done enough Hard Work to crack the exam, are very definite about their preparation. So we want to tell all those students to have some patience. The Admit Card will be Published on the Official Website very soon. The Candidates are advised to have some patience and to continue their Hard Work with full of sincerity. The candidates are also advised not to forget their Admit Card while appearing for the Regional Language Test. The Pre Exam will be Multiple Choice Objective Type. There will be Three subjects in the Exam. (i) English Language (ii) Reasoning (iii) Numerical Ability. English Language will have 30 Marks/ Questions Each & Reasoning and Numerical Ability will be of 35 marks/ Questions Each.Total 100 Marks/Questions. The Maximum time duration will be of 60 minutes (01 hours). Just Make it Large! Yesss!! Copyright © 2019 24JobsExam.in All Rights Reserved. Awesome Inc. theme. Powered by Blogger.